How do you describe the Mediterranean diet? Much research has shown that it provides health benefits to create optimal health and longevity. But most cannot describe it adequately or how to use it to benefit an individual in every day life. A plethora of research has been filtering in recently substantiating the health benefits even further and showing that eating a Mediterranean diet is not only healthful (abundant in fruits, veggies, whole grains, legumes, fish, poultry, lean meats and more), but promotes weight loss as well…enter Barry Sears, PhD. Dr. Sears is a pioneer in weight loss and optimal health and a leading medical researcher on the hormonal effects of food. He revolutionized the dieting industry with his #1 New York Times bestseller The Zone. Dr. Sears has taken the principles of the Mediterranean way of eating and created a diet that will optimize health, weight loss and longevity to anyone whether vegan, paleo or in between. I found Dr. Sear’s book The Mediterranean Zone an excellent book for anyone who desires to create optimal health, age younger or to lose weight. Dr. Sears has taken the guess-work out, identified the factors that make the Mediterranean diet work and has packed this amazing book full of information, an eating plan, delicious recipes and more. Dr. Sears, what were your reasons or what motivated you to write The Mediterranean Zone? What do you feel is the core cause of weight gain, illness and faster aging? Is there only one core cause? In my opinion, the driving force behind all three conditions is increased inflammation and its disruption of hormonal signaling systems in our cells. To elaborate, what are the inherent reasons why weight gain, illness and faster aging are occurring and at a much greater rate than ever in our history? Our diet has become far more inflammatory in the past 50 years. This diet-induced inflammation is driven primarily by the globalization of food and the reduction of its cost. The trade-off has been in the increase in expression of our inflammatory genes. Can you explain how The Mediterranean Zone can help readers specifically with their health and weight? The key lies in balancing your plate at each meal with colorful carbohydrates (fruits and non-starchy vegetables) and low-fat protein that are low in omega-6 and saturated fats. You know if you are successful in making the right balance if you aren’t hungry or fatigued for the next five hours. Lowered carbohydrate diets are showing excellent success with those trying to lose weight. What is your view on low-carb diets relative to weight loss? Balanced low-carb diets are excellent for weight loss and more importantly for long-term weight management and management of chronic disease. Unbalanced low-carb diets that generate ketosis are probably not. Harvard Medical School has shown that a ketogenic diet increases cortisol (the hormone that makes you fat, sick, and age faster) as well as decreasing thyroid hormones (the hormones that make you energetic). I don’t think that long-term weight gain, poor health, and fatigue makes good dietary sense. A common problem I encounter with people who are overweight is the feeling of hunger they experience, as if they feel they never have enough to eat or that the feeling of being satisfied from eating a meal does not last long. In your opinion, what is the reason or reasons people are eating more calories today? Is it true hunger? Hunger and satiety are the result of complex interactions of incoming hormonal signals into the hypothalamus. Inflammation disrupts satiety signals meaning the more inflamed you are, the hungrier you become. I am very excited about the recent gut inflammation-weight gain correlation. What are your thoughts about this and digestive health as it relates to gut bacteria? The Mediterranean Zone explores this exciting area is great detail. In my opinion, the levels of polyphenols in the diet have a central role to play in managing the composition of the microbial community in the gut and its controlling the potential export of inflammation by those microbes into bloodstream. To date, a plethora of research is showing artificial sweeteners to be a culprit in storing fat, hunger and cravings. What is your opinion regarding artificial sweeteners? Should we use them? I think the data is far from clear-cut (except in the case of aspartame) on artificial sweeteners. Their best use to is not to sweeten food products, but to overcome bitterness of ingredients in food products. This is especially true of any product that is rich in polyphenols as they are incredibly bitter to the taste. The field of epigenetics is fascinating and very empowering to those who understand that we can exert some control in the outcome of our gene expression, whether positive or negative. What are your thoughts on the role epigenetics plays in our weight and our health? As I point out in The Mediterranean Zone, this is the great unexplored field that is very germane to anti-inflammatory nutrition as many of these epigenetic marks (good and bad) are induced by the diet. Furthermore, fetal programming can transmit and amplify adverse epigenetic marks that affect metabolism from one generation to the next. This means that our struggle against increasing weight and declining metabolic health may be multi-generational. I’ve interviewed you a couple of times before on my radio show and I always ask you this one question because the answer is powerful: If you had to choose only one supplement, what would that be and why? That’s easy. It would high-dose fish oil. The reason is that only with higher doses of omega-3 fatty acids can you activate the resolution phase of inflammation that brings the body back to equilibrium. The fact that high levels of omega-3 fatty acids in the blood also increase lifespan doesn’t hurt either. To sum up this interview, what advice do you have for the reader who may be struggling with his or her weight and/or health? It may not be your fault. If you have weight problem or chronic disease, you really have an inflammation problem. This is why anti-inflammatory nutrition has such great potential in the future of medicine. You have to eat, so you might as well as eat smart. I believe The Mediterranean Zone provides a scientific blueprint how to do this that is compatible with every possible dietary philosophy from vegan to Paleo. Can you please let the reader know where they can find you, your excellent new book ‘The Mediterranean Zone’ or any of the books that you have written so they can easily move forward with their weight and health success. The Mediterranean Zone and all of my other books should be in major bookstores and always available online. Thank you very much Dr. Sears for taking the time to help others create optimal health, age younger and lose weight! Your knowledge and expertise has been and will continue to be, a blessing for so many. © 2014 DLS HealthWorks, LLC. 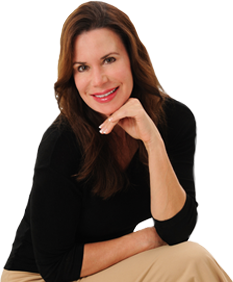 Lori Shemek, PhD, CNC, health and weight loss expert is the best-selling author of ‘Fire-Up Your Fat Burn!